Immerse yourself in the Canadian Arctic wilderness to experience one of the largest beluga whale gatherings in the world. This exploratory tour will take you to a remote camp at the Cunningham River estuary, where you will spend six full days exploring the high Arctic’s landscapes and wildlife by bike, kayak, ATV, plane, truck, and on foot. Discover a dynamic ecosystem amidst this rugged scenery, with possibilities of polar bears foraging along the shorelines, ringed and bearded seals swimming amongst the pack ice, arctic fox pups playing in the grasses, and so much more! You will also discover this region from above as you fly to Prince Leopold Island, Canada’s largest seabird colony, searching for the rare and elusive narwhals and bowhead on the way. • Discover the Cunningham River estuary filled with hundreds of charismatic beluga whales which gather here every summer! • Immerse yourself in the far reaches of the tundra, on the shores of the Northwest Passage, and encounter musk oxen, falcons, foxes, polar bears, and other charismatic wildlife. • Fly to Prince Leopold Island, Canada’s largest seabird colony, searching waters en route for rare and elusive narwhals and bowhead whales. • Go wildlife sightseeing, kayaking, hiking, walking, biking, and exploring with ATVs. Aug 1 Depart homeward from Yellowknife, Canada. Ted grew up traveling extensively and began studying and photographing wildlife as a child. 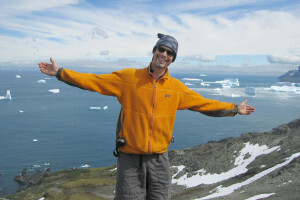 After completing a Master's degree in Tropical Conservation Biology at Duke University, Ted returned to California to lead and organize expeditions full time with Cheesemans' Ecology Safaris. Ted currently leads expeditions to Antarctica, the Arctic, and the Caribbean while pursuing a doctoral degree studying humpback whales. He also recently founded the citizen science project Happywhale. Arrive in Yellowknife, Canada for an overnight. We will meet this evening to communicate a plan for the flight to Cunningham Inlet tomorrow. After breakfast, fly through the scenic Canadian arctic and arrive at the Arctic Watch Wilderness Camp/Lodge. Our flight time will depend on weather conditions; we expect to be able to travel in time to enjoy a late afternoon in the high Arctic, including a tour, potential wildlife activities, and a welcome dinner. Located at 74° North, on the northern end of Somerset Island, the Arctic Watch Wilderness Camp/Lodge is adjacent to the Cunningham River estuary, where beluga whales gather by the hundreds. You will spend six full days exploring this remote Arctic landscape and its rich and diverse wildlife, using the camp as your home base. Choose your activity each day, so you can tailor your time spent experiencing this remote haven. Your range of options (see below) include some more active and exploratory activities and others with a stronger focus on wildlife photography. The flexibility of splitting into smaller groups allows for excursions that fit your interests and maximize your time in nature. In the evenings, relax during informal lectures including the Northwest Passage and its history, Richard Weber’s recount of his unassisted journey to the North Pole in 1995, and Nansen Weber talking about wildlife photography or his work in this region and his experience with the local wildlife. For those who are adventurous, spend an evening taking the polar plunge challenge, a fun event to commemorate your time in this beautiful and pristine environment. Due to the unpredictable weather patterns of the Arctic, specific activities cannot be guaranteed, so flexibility is paramount. We strive to achieve all the noted activities and to stay in nature as long as possible. In the morning, get a quick introduction to the lodge’s ATV’s, and then go on a short walk to the Cunningham River estuary. Marvel as hundreds of beluga whales take shelter in the river mouth, only a few yards from shore. Observe these unique mammals socialize and make unique sounds to communicate. After lunch, you may hike to the five-story Triple Waterfall with opportunities to see nesting peregrine falcons, loons, snow buntings, sandpipers, and rough-legged hawks. On your way back to the lodge, you’ll cross a picturesque canyon with opportunities to see musk oxen wandering amongst beautiful Arctic flowers. Travel by ATV across the river delta and up the Musk Ox Ridge Trail to get spectacular views of the entire area. Along the way, expect to see musk oxen as well as arctic fox with pups. Picnic at Inukshuk Lake, where we’ll provide fishing gear if you would like to try your hand catching and releasing arctic char. Return to the lodge via the River Trail and stop to explore the unique Arctic Hoodoos (giant sandstone formations). Board a charter flight to get an aerial view of the surrounding region. Search for rare and elusive narwhals and bowhead whales as you make your way to Prince Leopold Island. Located in Lancaster Sound, this island is home to Canada’s largest seabird colony, one of the most important in the Arctic. It is a Migratory Bird Sanctuary, and thanks to special permits, you will land on the island and explore the multi-species colonies. See thick-billed murre, northern fulmar, black-legged kittiwake, and black guillemot roosting in the tens of thousands! The plankton-rich waters surrounding the island also attract many mammal species such as beluga, bowhead whale, narwhal, walrus, ringed seal, bearded seal, and polar bear. Spend the morning sea kayaking or stand-up paddle boarding in the Cunningham Inlet. Make your way through pack ice, ringed seals, bearded seals, and the charismatic beluga whales. After lunch along the shoreline, hike to Kayak Falls, a small canyon with stunning views of the Northwest Passage and look for polar bears wandering the tundra. You will reach a portion of the estuary where belugas are known to gather and interact with each other, offering a great spectacle to visitors. Travel to Flatrock Falls and either hike or truck to the mesmerizing unnamed canyons of Somerset Island. As you wander along these canyons that span up thousands of feet, look down in search of fossils that offer glimpse into this unique region’s past. You will also have many opportunities to observe the nesting sites of terns, plovers, and snow geese. After lunch, travel to Gull Canyon to witness the contrast between the desolate landscape that surrounds you and hidden corners rich with wildlife gems. Take the ATVs to Cape Anne to visit 1,000-year-old Thule archaeological sites. The journey is very scenic, taking you past ancient Inuit campsites, and with the possibility of a polar bear foraging along the shoreline. After exploring, return to the lodge via the Red Valley, where you will feel humbled by the sheer magnitude of these remote Arctic landscapes. Board one of the Lodge’s Mercedes Unimog trucks and make your way to the launch site, roughly 13mi up the Cunningham River. You will hike the last three miles to the launch site, crossing the Badlands, where two 8,000-year-old bowhead whale skeletal remains are found, as well as musk oxen, snow geese, arctic fox, and much more! Once at the launch site, enjoy lunch as the gear is prepared for your journey back to the lodge. You can make your way down the river on a kayak, raft, or stand-up paddle board, or mountain bike along the river. Spend your last morning enjoying Arctic Watch and choose from the many activities this region offers. In the afternoon, fly back to Yellowknife for an overnight. Transfer to Yellowknife Airport for your flights home. Immerse yourself in the Canadian Arctic wilderness to experience one of the largest beluga whale gatherings in the world. Costs are per person, double occupancy, not including airfare (except flights between Yellowknife and Arctic Watch and the scenic charter flight), singles extra. See Included and Not Included sections for more details. We reserve the right to charge for cost increases that occur between when we set tour prices and the date of travel, for example, changes due to the cost of lodging and transportation. If you are a single traveler and you desire, we will find a roommate for you. If we cannot find you a roommate, we may charge you a single supplement fee. Single rooms are subject to availability. Until the Final Payment due date, deposits are refundable except for a cancellation fee of $150 per person, which can be applied toward another tour if reserved within six months of the cancelled trip’s departure date. Cancellations are non-transferrable. No refunds are given after the Final Payment due date. All leaders, transport, camera fees, park entry fees, landing fees, and permits for all activities unless described as optional. Charter flights between Yellowknife, Canada and Arctic Watch on July 24 and July 31. Scenic charter flight to Prince Leopold Island. Accommodations for the nights of May 15 through May 27. Meals from dinner on July 24 through lunch on July 31. Airport transfers on July 23 and August 1 via hotel shuttle between the Explorer Hotel and the Yellowknife Airport (YZF), plus transfers on July 24 and July 31 between the Explorer Hotel and the charter flights. Non-alcoholic beverages and snacks at the lodge and during activities. Equipment (e.g., kayaks, stand-up paddle boards, river rafts, bikes, all-terrain vehicles (ATV), ATV helmets, fishing gear, paddling dry jackets and pants, life jackets, and more). All airfare (except flights listed as included), airport and departure taxes, and excess baggage fees. Airfare is approximately $800–$1,200 from the USA to Yellowknife, Canada, depending on origin. Gratuities – tipping is, of course, discretionary, however we suggest budgeting about $500–$600 total per participant for the entire trip. Trip cancellation insurance. For more information see www.cheesemans.com/travel-insurance. Items of a personal nature such as laundry, telephone calls, medical costs or hospitalization, room service, alcoholic beverages, items not on the regular menu, etc. If you have special dietary needs, please indicate them on your Reservation/Release Form. At this time of the year, the weather is usually nice and sunny. Of course, in the high Arctic you can always expect some cloudy, rainy, or cold weather. Average temperatures range from the low 40’s°F (~4°C) at night to the mid 50’s°F (~13°C) in the daytime, with warmer days reaching as high as 70°F (~21°C). In Yellowknife during late July, average temperatures range from the mid 50’s°F (~13°C) at night to the lower 70’s°F (~22°C) in the daytime. Most wildlife viewing is done from ATVs, Unimog trucks, kayaks, stand-up paddle boards, bikes, and on foot. Walks to search for wildlife are generally less than an hour long and over relatively flat trails. You can opt out of any activity. Please contact us if you have any health concerns that may make this trip challenging. Unless listed as included, airfare is not included in trip costs. Detailed logistical information and the contact information for our recommended flight-ticketing agent are included in the Trip Materials we will send you. Please let us know if you are arriving earlier or staying later as we are happy to assist you with any extra overnights that you might want to arrange. Flights you (or a travel agent) book: Arrive in Yellowknife, Canada (YZF) no later than July 23. Depart from Yellowknife, Canada (YZF) on August 1. Flights we book for you: The round-trip charter flights between Yellowknife, Canada and Artic Watch. The cost of this round-trip booking is included in the tour cost. The Arctic Wilderness Camp/Lodge is a semi-permanent building consisting of a main complex surrounded by private guest tented cabins, each equipped with a marine toilet and sink. Due to the extremely sensitive nature of this environment, the showers are located in the main complex. If you are concerned about the standard of accommodations being below your expectations, please ask us before booking. Medical conditions and travel risks: Travel to remote places is exciting, but it is important to understand and accept the risks, both medical and logistical. Minor medical problems can usually be treated, but because we are often far from medical facilities, there can be no expectation for immediate medical treatment or evacuation, even in cases of trauma. Anyone with health problems needing close medical supervision should not consider going on this tour. Bring enough medication for the duration of the trip for any chronic medical needs, since pharmacies are usually not available. When you send your deposit and signed Reservation/Release Form, you certify to us that you do not knowingly have any physical or other conditions that would create a risk for yourself or for other trip participants. Use of Drones/UAVs on Tours:Unmanned Aerial Vehicles (UAVs), AKA drones, can work quite well on this trip for viewing and photography of the belugas. Please discuss with us if you are interested in bringing a drone.